One of my absolute favorite rock musicians ever. I first heard the Jimi Hendrix Experience in 1967 and was hooked. I saw them perform live once, at the Lewiston Armory in Lewiston, Maine in 1968. I sat in the very last row of some risers on the floor straight back from the stage, and it felt like the bass was going right through me. Jimi Hendrix performed most of the second album, Axis Bold As Love, which is my favorite. I was once talking with a music professor from Stanford, and he told me Jimi Hendrix was the greatest influence on music since Wagner, and he may have been right. I've painted a few Portraits of Jimi Hendrix when I was young, but this is THE one. It's hung in my studio ever since I painted it about 40 yrs. ago, and it's the painting of Jimi Hendrix that's represented in the crown of my "Little Richard, King of Rock & Roll" painting with whom Jimi Hendrix played and was great friends,. PaulB's Pointillistic/Impressionist original oil paintings of Jimi Hendrix and various prints and poster formats of a wide variety of subject matter by the Pointillistic/Impressionist oil painter from landscape/waterscape paintings, dance, sports, portrait, to classical figures, flowers, rock and roll, Brazil, and Jimi Hendrix Portrait paintings and prints are available for purchase for as little as $24.95 for an 8" x 10" matted print on photo pape. Pointillistic/Impressionist Giclee prints of Jimi Hendrix on real canvas or heavy watercolor paper are available. 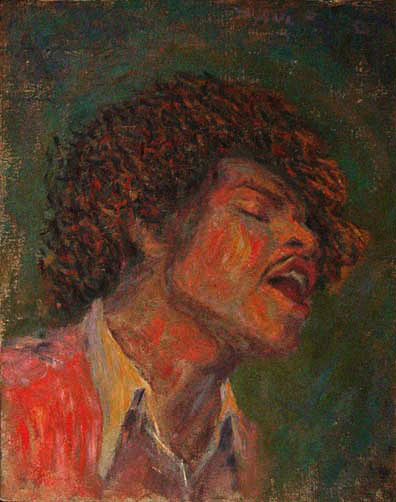 One of a kind Jimi Hendrix Portrait embellished prints, which are Giclee prints retouched in genuine oil paint by PaulB. Unless noted PaulB's original Pointillistic/Impressionist oil paintiings are oil on canvas. Paul Berenson's pointillistic/Impressionist oil paintings are in privale collections around the world, including the downtown Los Angeles Athletic Club and have appeared in numerous publications, including the New York Philharmonic Playbill. PaulB.com also builds websites and PaulB is a member of the LA Web Professionals Group.